Birds-eye-view: At the start of the Silver Age, as a new generation of heroes was being introduced, DC developed the concept of parallel earths, as these were the worlds where other heroes lived and had their adventures. The heroes of the Justice League were assigned to Earth-One, while the Justice Society was on Earth-Two. The Shazam Family protected Earth-S, while the Quality Heroes could be found on Earth-X. In the early 1980s, a new parallel Earth was discovered when Superman crashed into a meteor approaching his Earth. The resulting collision transported Superman and the meteor fragments to a new Earth. Let’s call it Earth-C for now. This Earth was populated not with humans, but with anamorphic animals living lives and doing tasks that normal people would do. We meet Rodney Rabbit, a cartoonist on the hit comic Just’a Lotta Animals. One of those meteors lands in Rodney’s garden box, where he grows carrots. Munching on an irradiated carrot leads to a transformation, and Rodney Rabbit becomes Captain Carrot, the first hero of Earth-C.
Captain Carrot quickly finds out that while he may be the first, he is not the only hero showing up thanks to the meteorites. Captain Carrot is joined by the likes of Rubberduck, Yankee Poodle, Alley-Kat-Abra, Fastback, and Pig-Iron. Together, the become the amazing Zoo Crew, setting up headquarters in the Z-Building in Los Antelope. The Zoo Crew face off against the likes of Frogzilla, Armordillo, Bow-Zar the Barkbarian, and even Gorilla Grodd! Rodney soon discovers that the Just’a Lotta Animals that he has been drawing in comics are real, and living on yet another parallel Earth, which we will dub Earth-C Minus. That leads to a couple of team-ups between the two squads, and a love triangle develops between Captain Carrot, Wonder Wabbit, and Super-Squirrel. The series concludes with a new member, Little Cheese, joining the Zoo Crew, but their adventures are not over. The team is drawn into a conflict between Lewis Carroll’s Wonderland and L. Frank Baum’s Oz. Captain Carrot and the Zoo Crew team up with Dorothy, Scarecrow, Cowardly Lion, Tin Man, and many others to rescue Oz from the Nome King. Why should these tails be Showcased? : You can approach this one of two ways. If you view this as only a funny-animal book, it might not be for you. But you could get this for a young reader to enjoy. HOWEVER, if you look at this as a creative exercise, this has the makings of a good read. The book is filled with animal references and puns. Brush it off if you will, but try it yourself. When’s the last time you intentionally tried to write something funny? It’s much harder than it looks. Writing standard super hero stories, dramatic stories or even dark and gritty stories are a piece of cake compared to writing comedy. Credit should really be given to all of the writers on this book for pulling it off each issue. Pawnotes: When the series started, Captain Carrot’s identity was Roger Rabbit. Over the course of the series, his name was modified from Roger Rabbit to Roger Rodney Rabbit to R. Rodney Rabbit to finally just Rodney Rabbit. While many people are familiar with the 1988 film Who Framed Roger Rabbit, most people are unaware that it is based on a 1981 novel, Who Censored Roger Rabbit? by Gary Wolf. DC opted to change the title character’s name to avoid any legal issues. 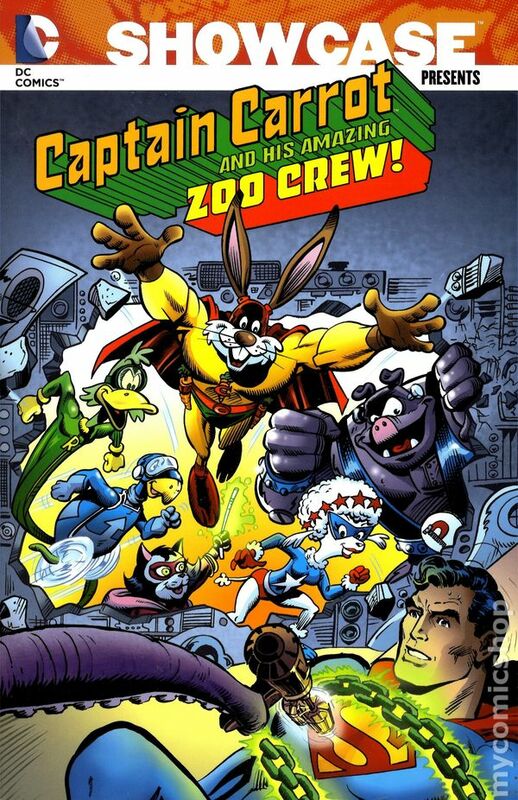 Captain Carrot and His Amazing Zoo Crew was canceled with issue #20, even though issues #21 to #26 were in various stages of production. At that time of the cancellation, DC indicated that the series would continue as a series of mini-series. The content from those unreleased six issues were collected into three double-sized issues which became The Oz-Wonderland Wars. If ewe like this volume, try: the Marvel Comics series of adaptions of L. Frank Baum’s original Oz novels by Eric Shanower and Skottie Young. Shanower has been linked to the Oz universe for most of his career, scripting adaptions for First Comics, Dark Horse Comics, IDW, and others. Beginning in 2009, he partnered with artist Skottie Young to adapt the six novels as mini-series, ranging anywhere from five to eight issues each. These stories have been collected into multiple hardcovers and trade paperbacks. In addition, all of the series were collected into an Oz Omnibus in 2014. These are fun reads that remain true to the books. Young’s art style may take some getting used to early on, but I grew to love the look of these books. This entry was posted in Captain Carrot, DC Showcase Presents and tagged Captain Carrot, E. Nelson Bridwell, Gerry Conway, Joey Cavalieri, Mike Sekowsky, Rick Hoberg, Roy Thomas, Scott Shaw, Stan Goldberg. Bookmark the permalink.